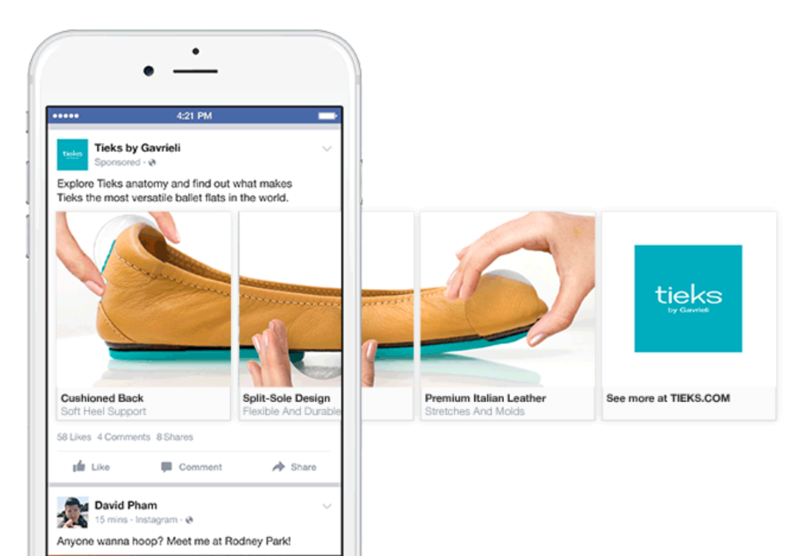 Facebook carousel ads are super-engaging, so why don’t all marketers use them extensively? 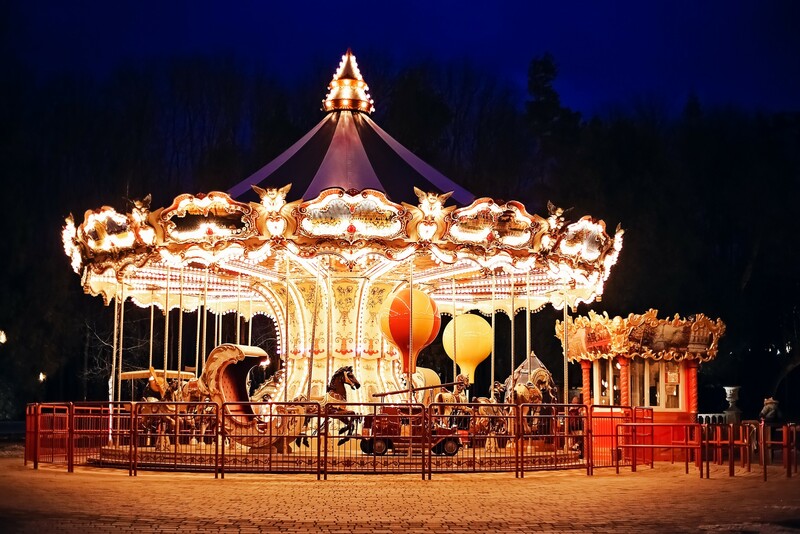 Here are some inspiring ways you can incorporate carousels in your marketing strategy. to reaching your target audience on Facebook. But how can you make sure that you are not only reaching your audience, but also engaging their interests? Carousel ads may be the simple solution that you have been searching for. If you’re looking to highlight the features for one of your products, the carousel format may be a perfect way to increase your click through rates. 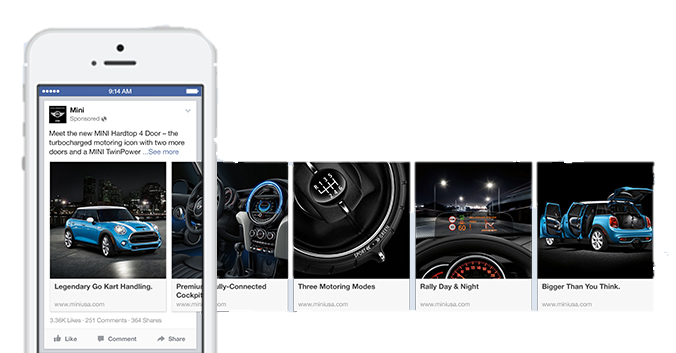 As you can see in the advertisement above, MINI used the carousel advertising format to give their audience a virtual tour of one of their newer models, highlighting all the car's exciting new features. Because Facebook allows you to have the same landing page for all of the images, the carousel was a unique way of displaying many high quality photos of one product, without making the viewers feel like they are being bombarded with too much information at once. Similar to the way that MINI used carousels to highlight the specific features of one of their vehicles— carousels can be used to magnify and separate the qualities of a single photo. This creative carousel use is unquestionably eye catching! In the advertisement above, Tieks did an amazing job of attracting the attention of their audience while also giving a highly detailed description of one of their products. With an insanely up close and high definition image of such a small product, it is clear that Tieks is highlighting the quality and craftsmanship that goes into creating a well-built shoe. Rather than trying to show a boutique of all their products, this company used the carousel format to emphasize their quality, thought, and efforts that go into each product and with the creativity to catch the eyes of their most frivolous Facebook scrollers. In the previous section, we talked about how you can use the carousel format to highlight the key features of a single product, but carousels can also be used to emphasize a collection of products. If you were looking to create an advertisement for up to ten products to fit on the screen of a phone, you would end up with a cluttered image that lacks information and would likely be scrolled past immediately by a consumer. Allowing marketers to place high quality images side by side with different landing pages, the carousel format is a perfect option for advertisers looking to showcase a collection of products. This type of ad is often used for retargeting people who have visited an ecommerce site but not purchased, to entice them to come back to either the product they were looking at earlier, or a related product. In the advertisements above, you can see that both Target and Jasper's Market used the carousel format to highlight a selection of products that they were displaying on sale. One of the main reasons these advertisements are so successful is the way that the carousel pictures are floating off of the screen and teasing an interested user to keep scrolling. Because a user may not be ready to click away from their Facebook feed just yet, the carousel format attracts its users to scroll through the “off page” products to see what else is on sale. For example, if I am someone who has been looking for fitness apparel, or specifically compression shorts, I might scroll through the target advertisement entirely to see if there is also a sale on what I have been looking for, and I might even find a product that I didn’t even know I wanted! Carousel’s formatting can also be used to show the process and simplicity of using the product that you are trying to sell. Like a flipbook, the carousels can flip through a storyline of pictures that can make the audience feel like this product is a simple solution to a problem that they have been having. emotional tool of making your audience think about putting themselves in the same shoes of the characters, and highlighting the main points in the product timeline, simplistically outlining the greatness of their invention! When creating a product, it is important to show your customers what problem your brand can solve for them. Don’t know what type of glasses fit your face? Coastal.com used a unique carousel advertisement -- to engage their users to select their face type --before even showing them any of their products. This type of advertisement is a unique way of making your customers feel like they are being given advice, rather than being sold a product which is becoming more and more important in today’s digital marketing landscape. 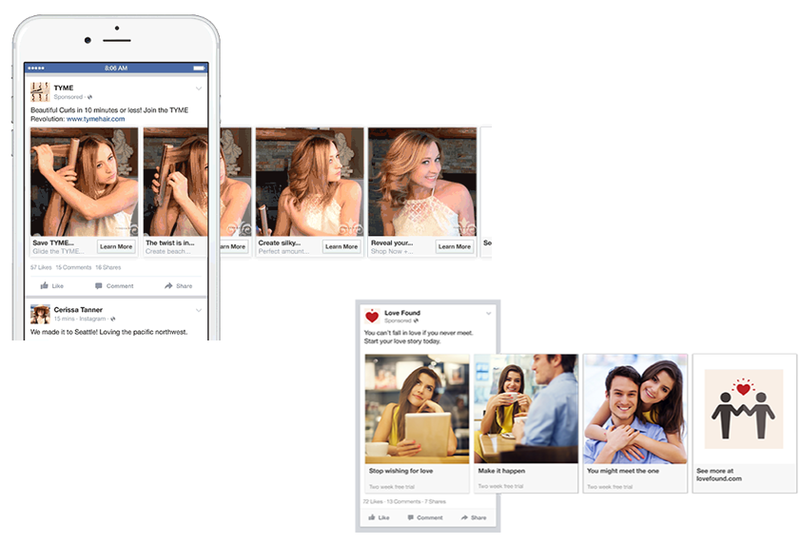 Facebook’s carousels which were introduced in 2014 have shown a great possibility for success for many types of advertising campaigns. Whether you’re trying to show the quality of a single product, show a slideshow of different services you can provide, or show your customers what problem you can solve for them, the creative and modifiable structure of carousels allows you to optimize your efforts and reach your audience effectively. But how can you know what ad types are most successful in the current competitive landscape? 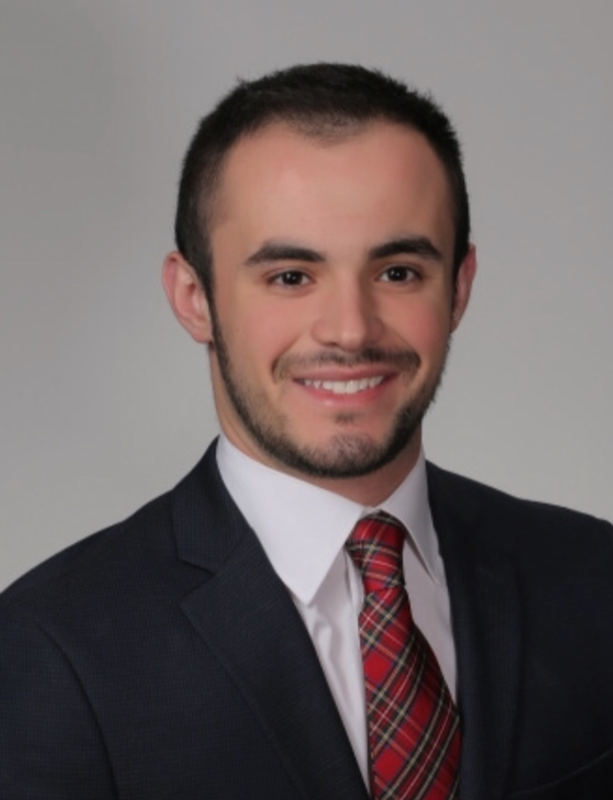 With the lack of transparency in today’s digital marketing world, you may be left in the dark. 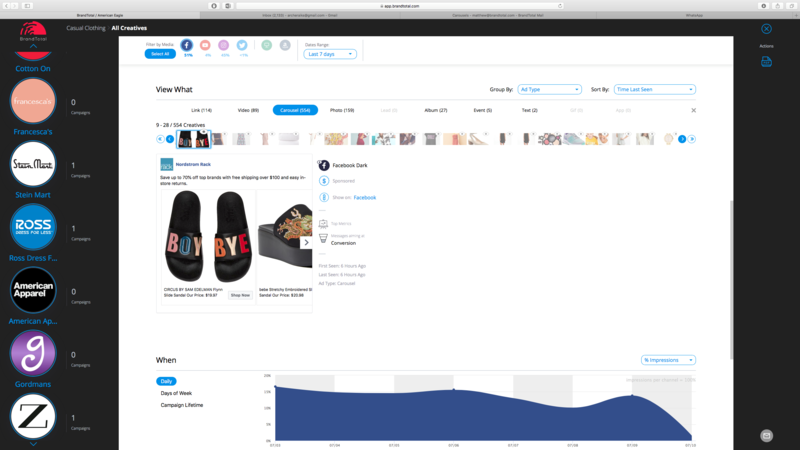 However, with a quick look into BrandTotal at how some casual clothing companies are marketing, we can see that in the past week alone, 554 out of the 950 creatives posted on Facebook have been in the carousel format. If you’re curious about how companies in your industry are using carousel ads, get in touch with us today!